First, there is the beginner level: The Sentiero attrezzato Colodri (visit link) . It is a short and easy ferrata which is often used by climbers to descend. Experienced ferraristi may even go without any gear, but of course we do not recommend it. Second, there is the advanced level: The Via dell'Amicizia, the friendship trail (visit link) . As a typical mountain ferrata it leads you to a summit (the Cima SAT). The Amicizia goes up 1200 altitude meters, half of it is climbing, and it contains the most popular and one of the longest iron ladders of the Alps. You need endurance and mountain experience (weather, falling stones, etc.). Third, there is the Expert level: Via attrezzata Monte Albano (Mori) (visit link) . It is much shorter (only ca. 400 altitude meters), and does not peak at a summit, but that does not make it easier. It is a very airy trail with lots of exposed passages and crossing sections, the most popular one being the “Traversata degli Angeli”. It is more of a sports ferrata and therefore requires some power in addition to endurance, too. A general note on cache maintenance: Obi11 regularly visits the area and will share the maintenance with me. To reach the cache, go up via GC1REWT (visit link) and GC1REXG (visit link) from Riva. You do not pass the last one directly, but it is close (a few min. extra). The via ferrata starts at N45° 53.046 E010° 49.731 at an altitude of ca. 600m. The cache itself is located at an altitude of ca. 985m right off the entrance of the ladder where a visible metal sign is attached to the rocks with some hooks, containing a verse from Renzo Tonelli, just right from the ladder start. From that sign you will find the cache ca. 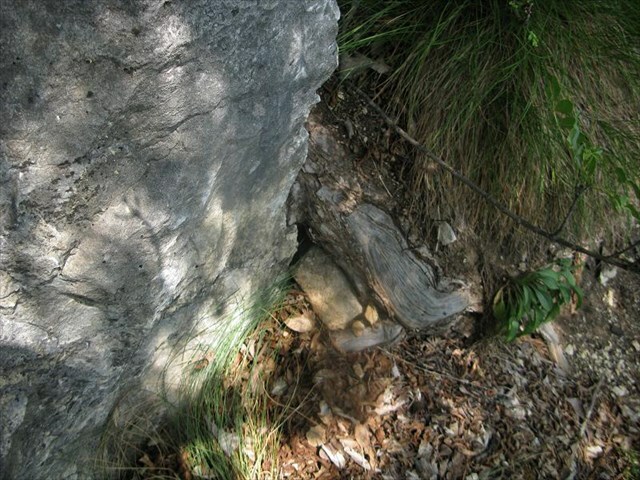 3m right, around the rock, under a very visible root of a tree, behind an equally visible stone which is stuck inside of it, at a safe place (no need to risk anything to reach the cache!). You are looking for a petling container. Hint for summit approach (which you should not miss): When standing in front of a rock with nearly unreadable big red letters painted on it, take a right turn to come from the front (lake) side. Desent: Cross the Cima Sat and the little helipad behind. Take Sentiero Crazidei (#418) down back to Riva from where you started. SpoilerYour view on the cache site when you come from the metal sign. Again: No need to risk anything! 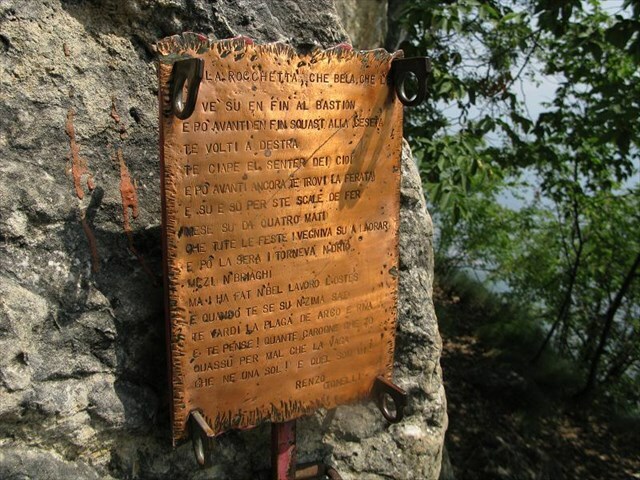 The metal signMetal sign on the via ferrata Amicizia above Riva.